Pink roses are my absolute favorite. I received my first dozen roses ever (they were pink) from my sweet high school boyfriend when I was 16 and not feeling very well. The roses came along with a brand new pair of Nike tennis shoes, a bunch of "Hubba Bubba" bubble gum (there is inside significance there) and a poem that I still carry with me. It was a sweet, kind gesture that I remember fondly. Pink roses are the longest existing roses known to the world and are depicted in some of the earliest known pieces of art. 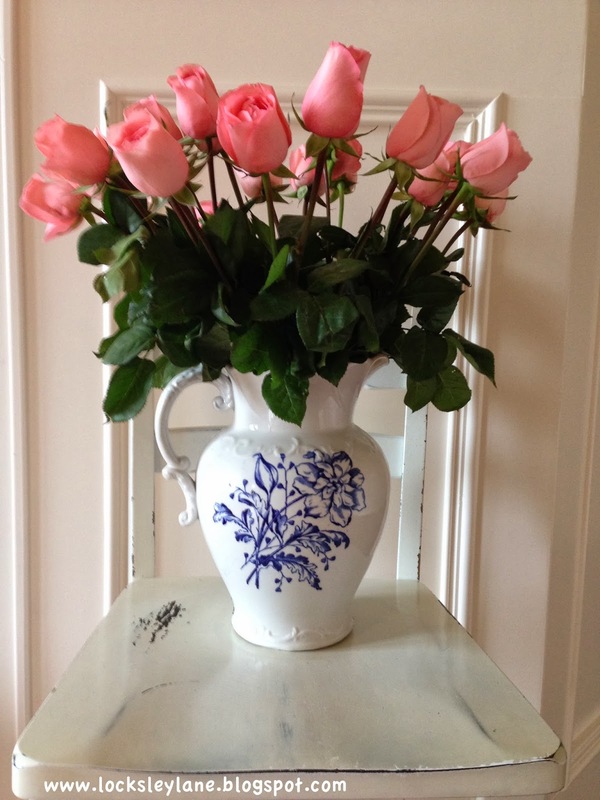 All beauty and fragrance associated with roses can be traced back to the pink rose. Roses are not only a symbol of love and gratitude but the pink rose carries with it, its newer connotation of grace, elegance, sweetness and romance. I love them because I think they are beautiful and sweet and they remind me of that time when I was 16 and all of life was before me. As I've gotten older, I am learning to appreciate what I have and I am trying to become more kind and thankful in all that I do. I want people to be kind, but that always isn't the case. The trials and tribulations of life are not always easy. So if you are going through a tough time and you feel like life is handing you lemons or you need a bit of inspiration....I want you to read the poem that my husband gave me so long ago. Maybe it will help you feel better or make you see things in a different light. When he might have captured the victor's cup; And he learned too late when the night came down, How close he was to the golden crown. We all need support at one time or another. Will you lend yours to someone this weekend? Thoughts about growing up on Locksley Lane warm my heart. We were a pretty traditional family back in the day and dinner was always at 6pm. In an Italian family, food is a very important part of your life so we had a set time every night to sit as a family and eat. One of my favorite memories was walking into the house on Wednesdays after school and smelling the homemade spaghetti sauce cooking on the stove. (Yes, every Wednesday). Trust me, there isn't a better smell around. Now I know most moms and women today are busy and don't always have time to whip up something homemade and healthy. We come home from work or a busy day and usually head right back out the door to swimming, soccer, basketball, football, dance, wrestling or some other after school activity. No sooner are the kids in the car and we are on the way home and we hear....."what's for dinner?" Ugh, the dreaded dinner question. Even if there are no after school activities, we are tired and cooking is not all that much fun when you are pooped! I want to share a simple, healthy and easy one pan pasta dish that you can whip up in literally 20 minutes! I got this recipe off of Pinterest one night as I was surfing for new dishes. I passed it on to several others and they said it was a hit with their family too so I thought I'd pass it along to you. This recipe comes from She Knows Food And Recipes and it is a keeper! Add beef and onions to the pan and cook until the beef is browned and the onions have softened. Add the garlic to the pan and cook for 30 seconds, until fragrant. Add the tomatoes, broth, water, orzo and seasoning. 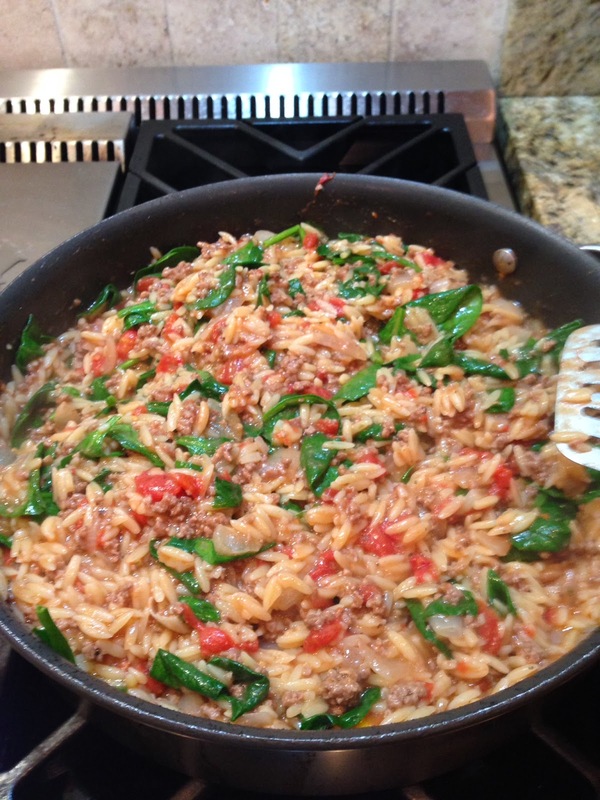 Mix everything together, bring to a boil then reduce to a simmer and cook covered for 10 minutes, stirring occasionally until the orzo is fully cooked. Stir in the chopped kale/spinach until wilted. Top with the Parmesan cheese and serve. We double this in our house and I have found that I have to use a little bit more chicken stock than what the recipe calls for. Check your pasta halfway through cooking. If the pasta seems too "al dente" or the dish seems a bit dry, add a little more stock so the pasta can soak it up. I use spinach vs. the kale and serve this with a side salad. Don't forget the "parm". Now it's not mom's spaghetti sauce (coming in a later post) but its a good quick healthy meal. Woo hooo! 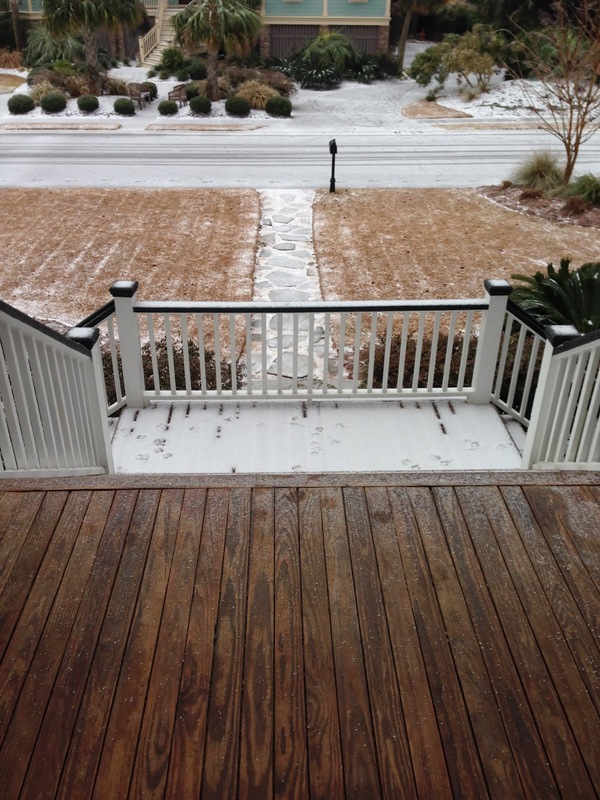 Snow day in Charleston! I know, I know... all my northern friends, that this isn't really what we call a snow day back home ... but this is actually what closes down the south. What y'all need to understand about living down here (like the accent? ), is that we are not equipped for cold weather of any kind. It's actually ice on the ground, which is a whole different story and it did get below freezing last night - which is unusual for us down here. Lots of problems and lots of accidents. All of our bridges are closed down - which means, you can't get around Charleston. If you are on the wrong side of the bridge you are in a boat load of trouble. 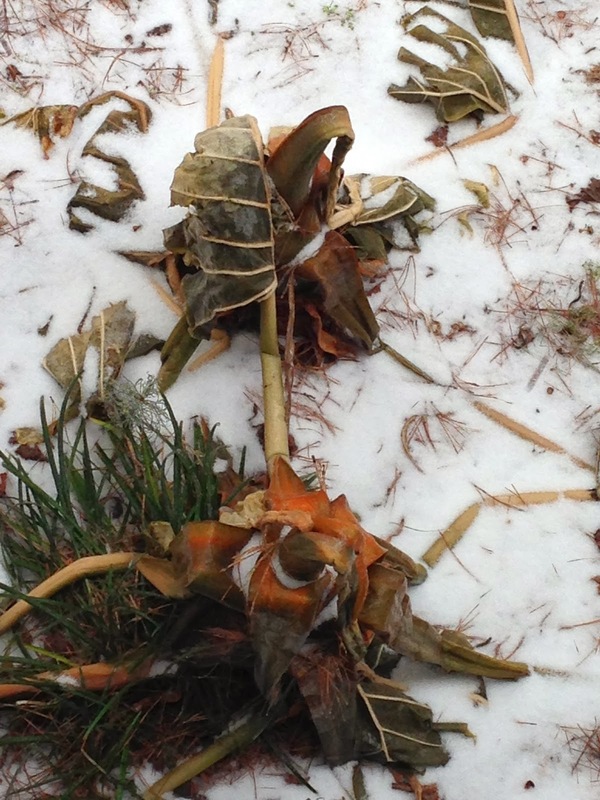 Look at my poor plants. Even they didn't survive. They were huge Elephant Ear Plants.... Not so much anymore. Instead of working on some projects, I'm going to sit back and relax today. It's not often we get a snow day to enjoy. Be safe and stay off the roads. 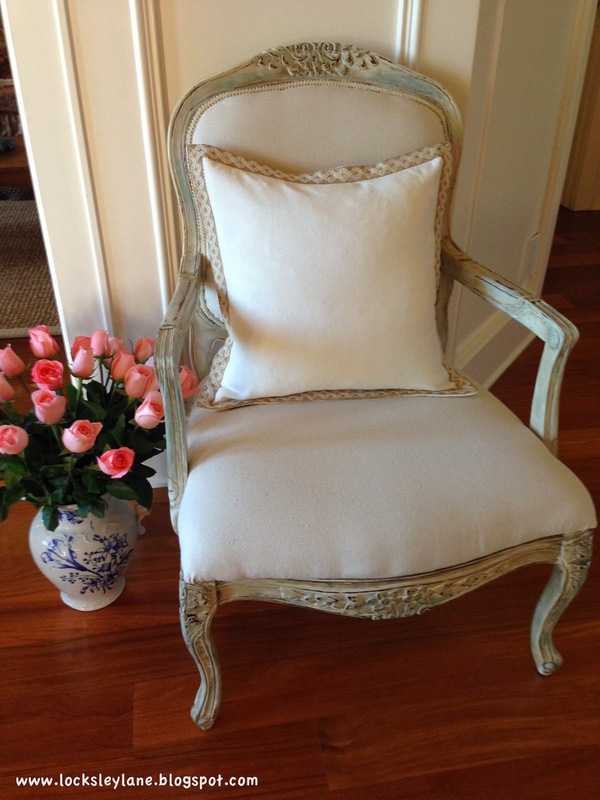 I have always wanted to makeover a french chair....I just needed to find the right chair. That is when I found this baby and dragged my friend Barb out into the middle of South Carolina to help me pick it up. I'm sure she was thinking....."um yeah, ok..." Then I started to take it apart. 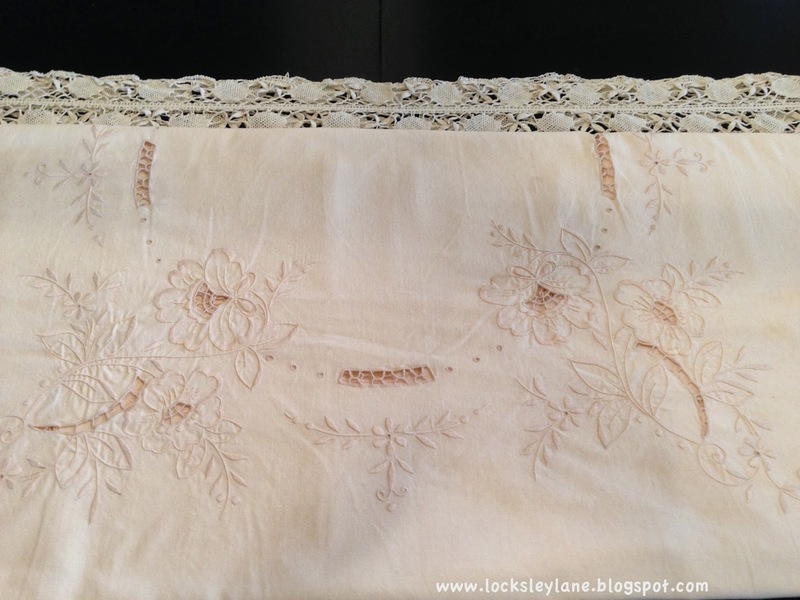 Once all the staples were out (and there were tons of them) I used ASCP in Provence, some French Linen and Old White. It was a little more grey than I wanted it to be but I knew I could fix this with a dark wax glaze. 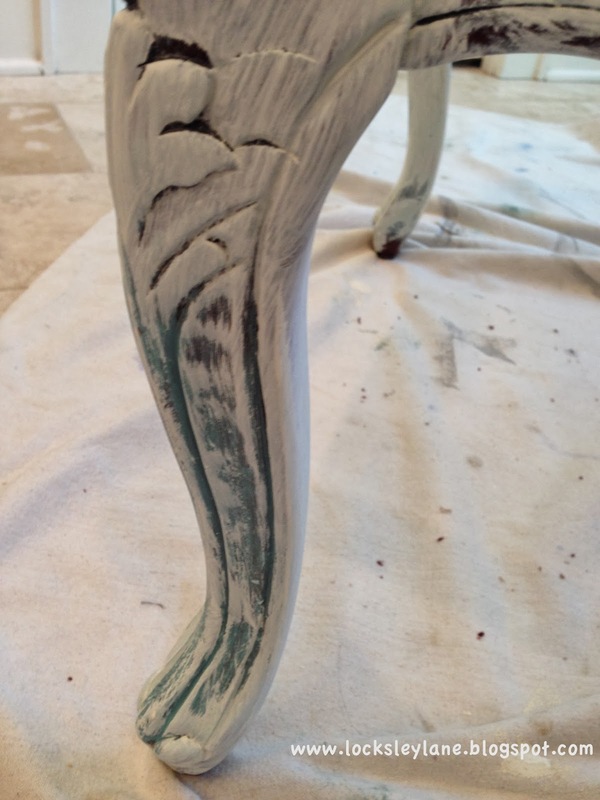 If you add a little bit of mineral spirits to the ASCP dark wax, you get a beautiful dark glaze that will age the paint. It is also much easier to put on than using your wax brush. Just wipe it on with a cloth. I ended up using a $4 drop cloth from Lowes for the material. Yep, a drop cloth. I washed it several times in hot water and bleach and then ironed it. It is the perfect material! 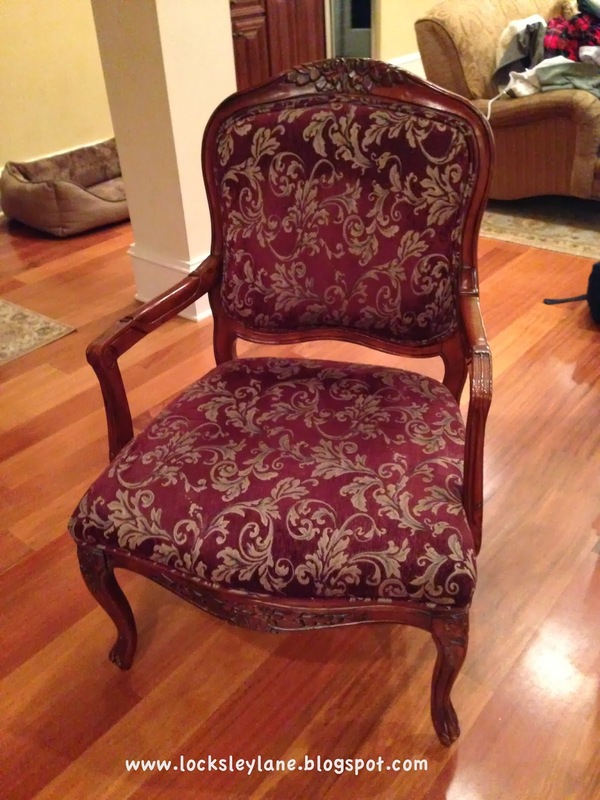 I was going to sell this chair, but I like it so much I'm going to keep it! 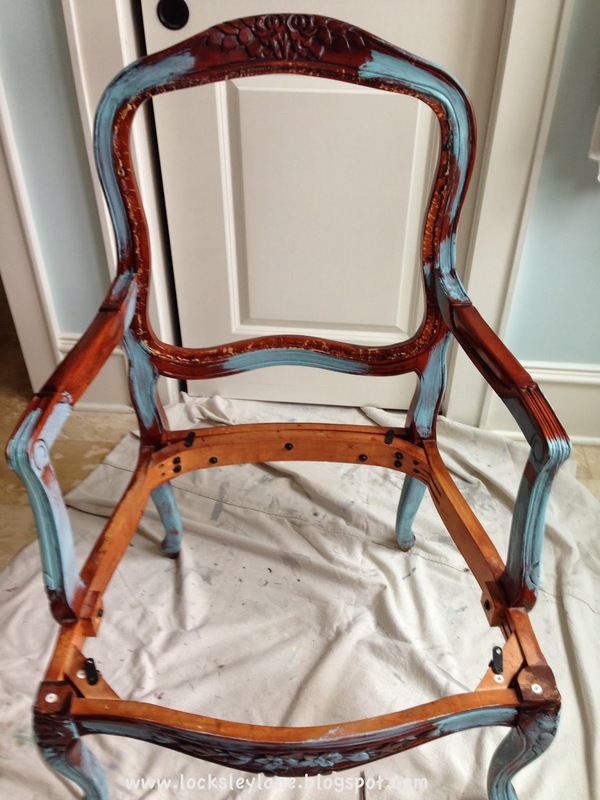 Do you have an old chair that you can transform? If you need help, let me know. Let's face it, sometimes life is hard. Life doesn't always go the way we plan it. For most people, life is pretty chaotic and unfortunately - pretty stressful. We lose the joy in life and lack the ability to find comfort in little things. We are always looking for the next solution that will make our situation better. We lack peace. If we are constantly running, working and talking we miss out on the small things in life. We have to make time to be quiet and listen. Listen to that little voice inside your head. Feel that small little nudge guiding you to change directions or stay the course. Today, find time to be still.....just for a few minutes. Do something small for yourself. Sit and feel the sun on your face. Get a cup of coffee or tea and sit and enjoy it. Buy yourself some flowers and marvel at their beauty. 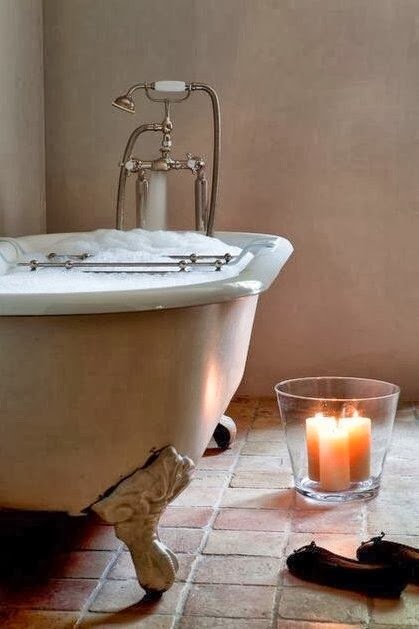 Take a bath and relax. Everything will still be right where you left it when you are done. Give yourself ten minutes of uninterrupted silence. I believe that spiritual blessings come wrapped in difficult situations. Be still and let the blessings come your way. 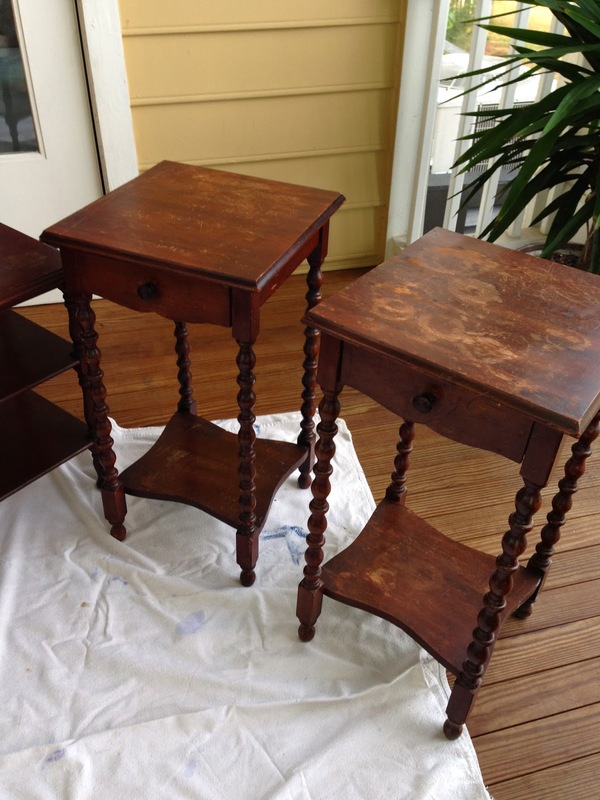 One of the things I love about refinishing old furniture is that I get to decide what a piece will look like. And sometimes, I don't know what that will be until I get started. Once I put that first layer of paint on a piece it begins to have a mind of its own. 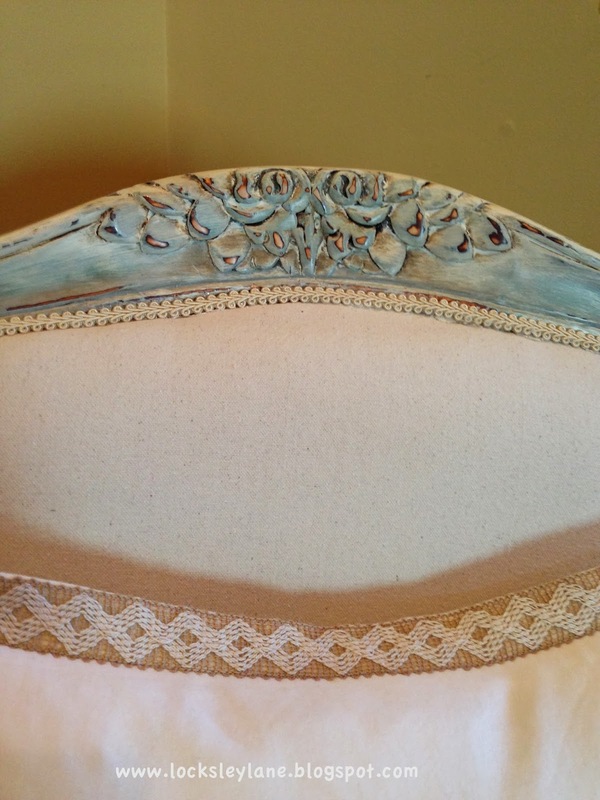 The best part about vintage or old pieces, is that the piece doesn't have to be perfect. In a world of perfection and beauty, I find this in the worn edges, cracks and chips that are in old pieces. Those imperfections tell a story. A woman sent me an email asking me how to get her paint to look perfectly smooth without imperfections. If you want perfectly painted pieces, I can tell you how to achieve this but then I ask why? Let your old pieces tell a story and free yourself from feeling like your piece has to be perfect. I was in Celadon the other day, a neat home furnishing store here in Mt. 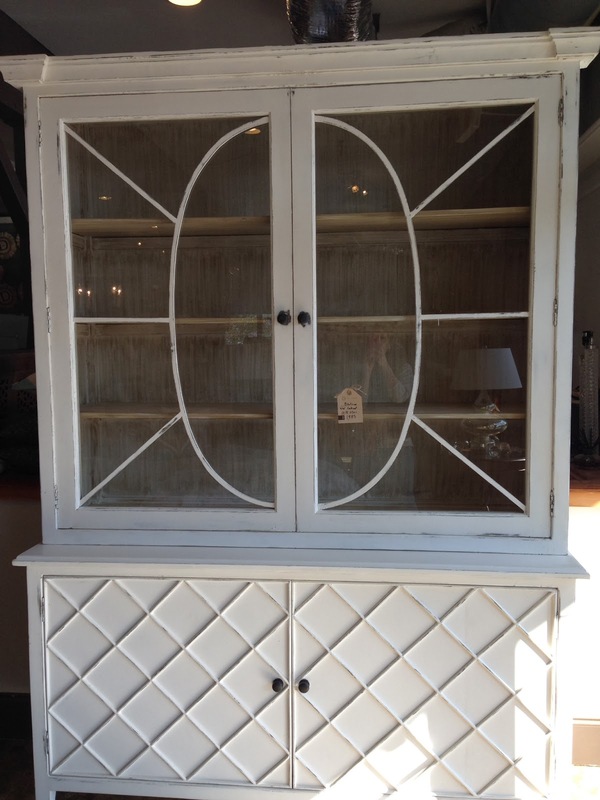 Pleasant, SC and was looking at this fabulous white hutch. It was beautiful and new and made to look old and worn. 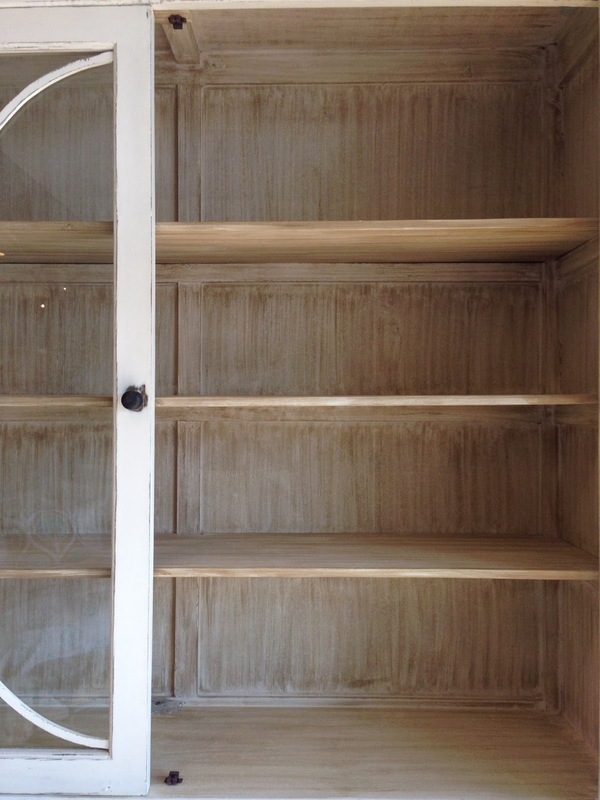 The inside had a finish that you can easily achieve with a dark wax or a glaze using heavy brush strokes. 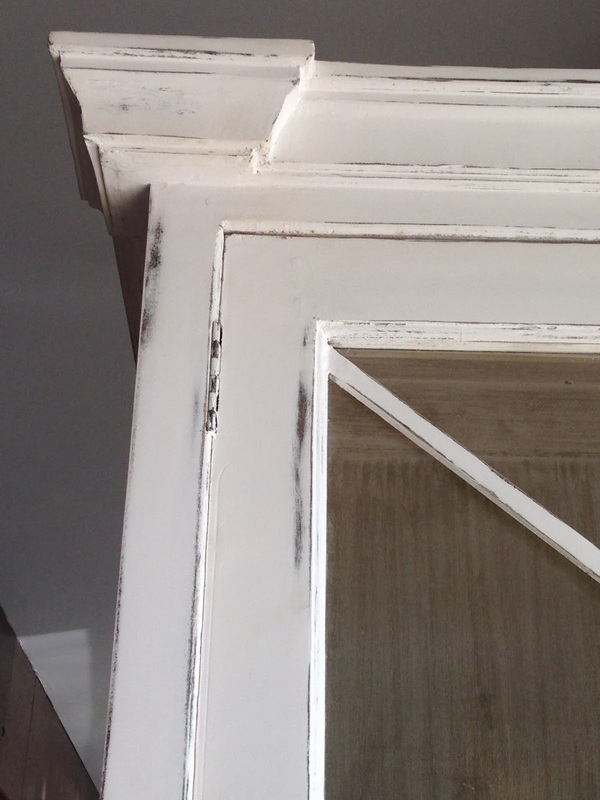 The edges were heavily distressed so you can see the wood through the paint. The distressing and glaze gives the piece character and makes you feel like it has been moved around and opened a thousand times. Is it perfect? Yes. It is perfectly imperfect! 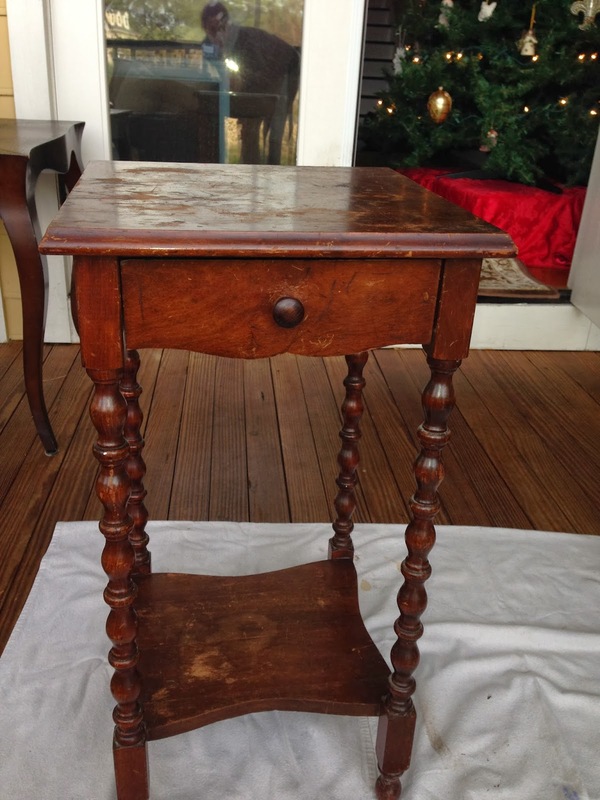 And that is what is great about refinishing old furniture - or, in this case, buying new furniture that looks old. 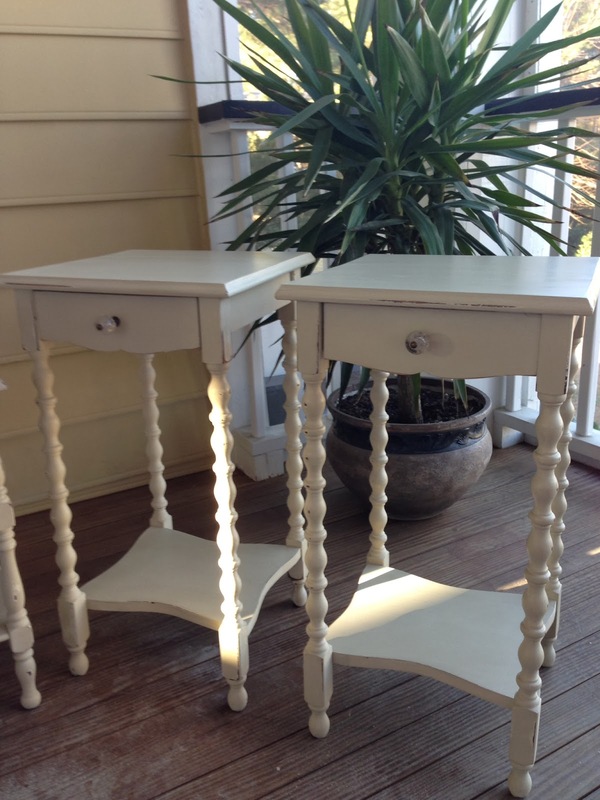 I love little end tables with spindle legs and little curves. I found these when a sweet girl was graduating from the College of Charleston. She was moving on and getting rid of some very college used pieces that she didn't need any more. Time for a makeover. 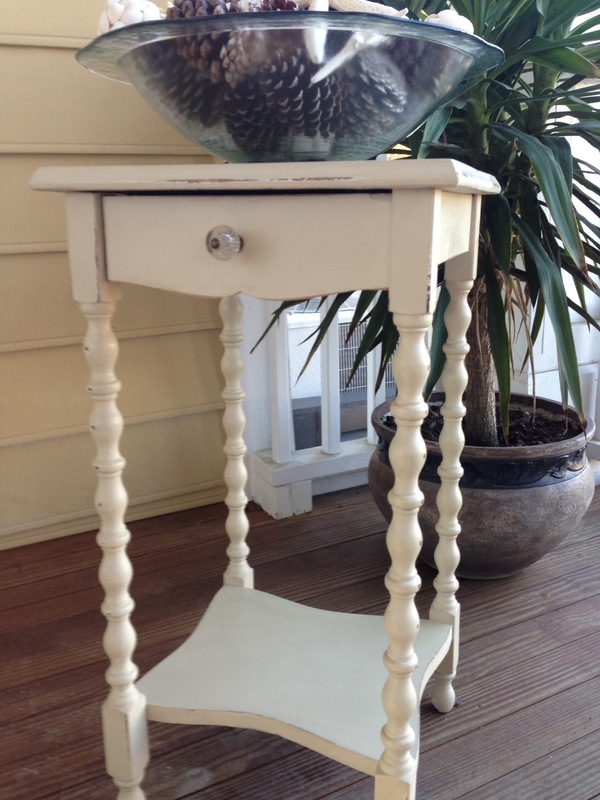 I used Annie Sloan Country Grey, a little bit of clear wax, replaced the knobs, and they look brand new. No primer, no sanding. Just a little distressing at the end. 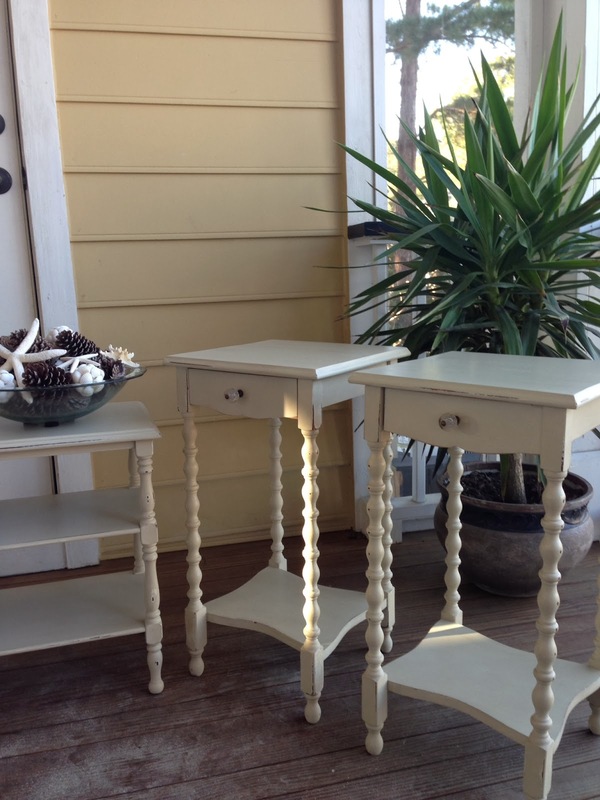 I know you have some little end tables that need a makeover...right? Go get some paint and do your own makeover. You can have a new look tomorrow. 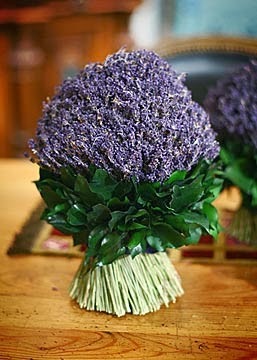 Lavender is one of the most recognized scents in the world. Not only is it beautiful to look at, but it also has many distinctive qualities and ways that it can be used. It is a fragrant, aromatic herb that is used in candles, lotions, baking and healing. It is most widely used to help with insomnia, nervousness and anxiety. It has a tremendous calming effect. Let me repeat that.....it has a tremendous calming effect. In my yearning for more kindness this year, I am finding more and more examples of the lack of kindness around us. Is it the virtual world? iPhones, emails, instagram, texting.... What is going on around here? I am trying to be content and peaceful and exude kindness from myself but I keep getting side tracked with this "ugly character" that keeps showing up. He won't go away. He is rude, foul mouthed and lacks etiquette. More lavender please. Have you been to a sporting event lately? I have kids and they each played sports. Never, in all my soccer mom craziness did I ever yell at another player or make fun of a player or write a nasty email telling the coach what a horrible job he was doing. I was the good mom that cheered for the team and encouraged my children along the way. It was called good sportsmanship and we were taught this from an early age. Occasionally, one of the kids would act up but a parent? More lavender please. My oldest daughter and I went to watch my son play basketball the other day. The women behind us were so awful with their language, that we almost had to move. They were yelling at players, the referees and making fun of other players. They were moms! When did this behavior become acceptable? Did you watch the NFC football championship last night? If not, let me tell you that you missed a spectacular display of "I am the man" conduct as one player motioned to another player with the "choking" sign and then verbally attacked a different player with "I'm the best and you are sorry" words with the sportscaster after the game. How did we get here? More Lavender please. "Winning" has become a predominant focus today. Sadly, life has become all about winning in so many ways. Not only on the sports field, but in college admissions, salaries, homes and things. Everything has become a competition and being the best or having the best is what everyone seems to be reaching for these days. What a lot of people miss or forget, is that there is more to life than just winning. Life is about reaching and trying and who you become in the effort. It's about the climb and the journey and what we learn along the way. We don't teach this very much today and certainly not in athletics. I definitely need more lavender please. To the man who feels "embarrassed" that his team isn't winning and emailed his feelings to the coach the other night.. let me say thank you for your insight. You are clearly unaware of the daily efforts and agonizing attempts - for your team to get where you want them to be. Trust me, their lack of winning is not intentional nor meant to cause you embarrassment. With the electronic era, it is difficult for some of us not to express our personal opinions - immediately. We are learning to hit "send" without much thought. Why not reach out and criticize someone. It's that easy. More lavender please. 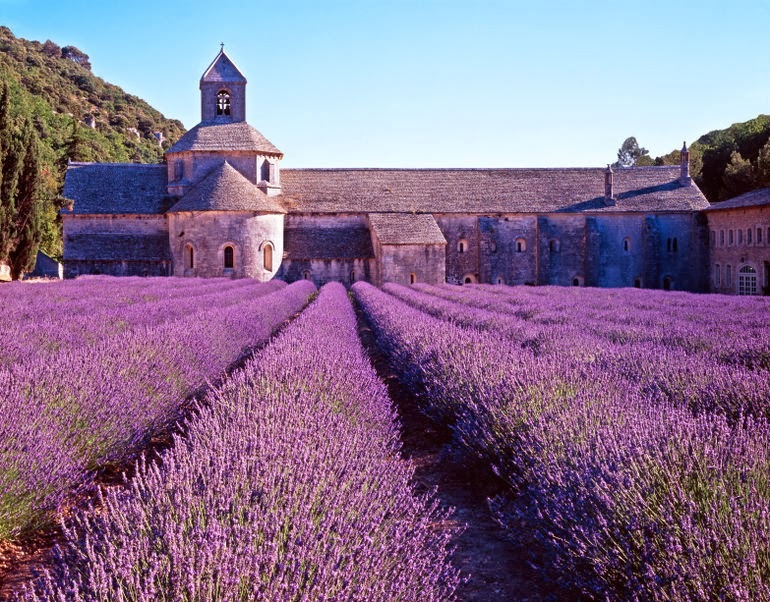 I would love to see Provence, and it's rolling hills of lavender. 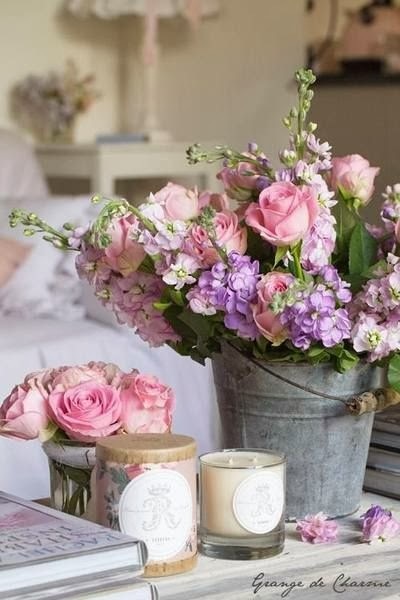 I can imagine the scent lulling me into a serene and peaceful way of life. 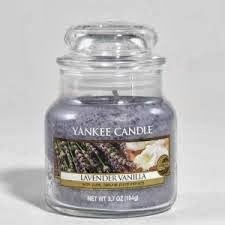 Until then, I will light my own lavender vanilla yankee candle, take deep breaths and remember that life is about the journey. 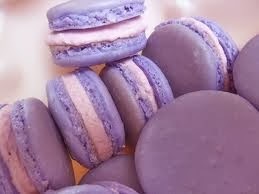 I will also put a little more lavender in my life. 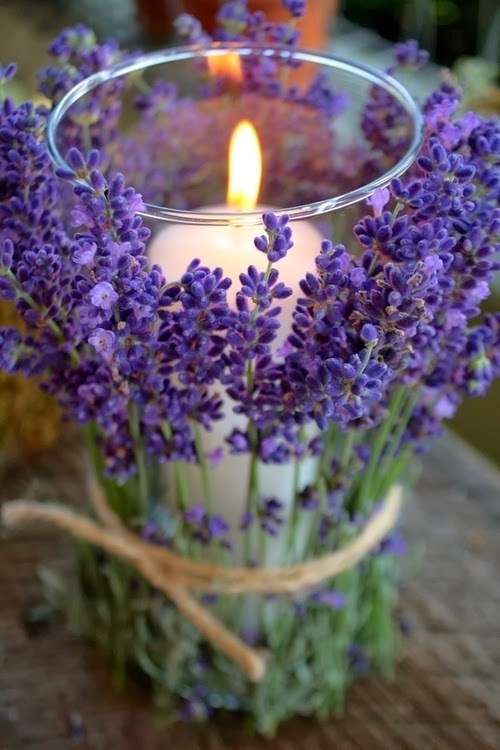 Fill your life with lavender. 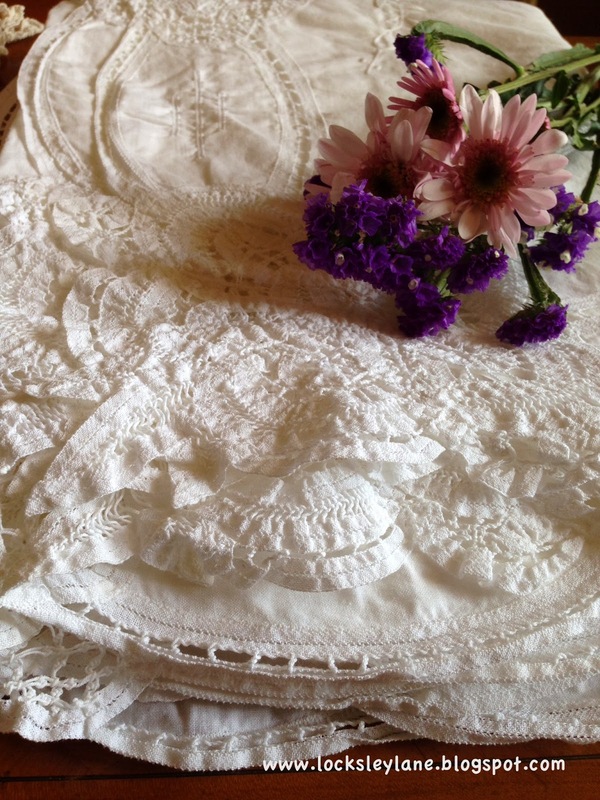 I was fortunate to inherit several beautiful vintage linen tablecloths from both of my grandmothers. At the time, I had just graduated from college. I didn't own a home much less have a table to put them on. Fortunately, my mom encouraged me to tuck them away and keep them for a later time in my life when I would appreciate them. I am so happy I listened to that little piece of advice. Although I love all of my old linens, one in particular is an absolute favorite. The one below is from my Italian grandmother and her sister, my great Aunt Mary. My dad's family came to the U.S. from Calabria, Italy to Brooklyn, NY in 1920. There were four sisters and each of them sewed. In fact, my Aunt Mary was so talented with her hand stitching, that she actually worked for the original NY Macy's in the linen department. 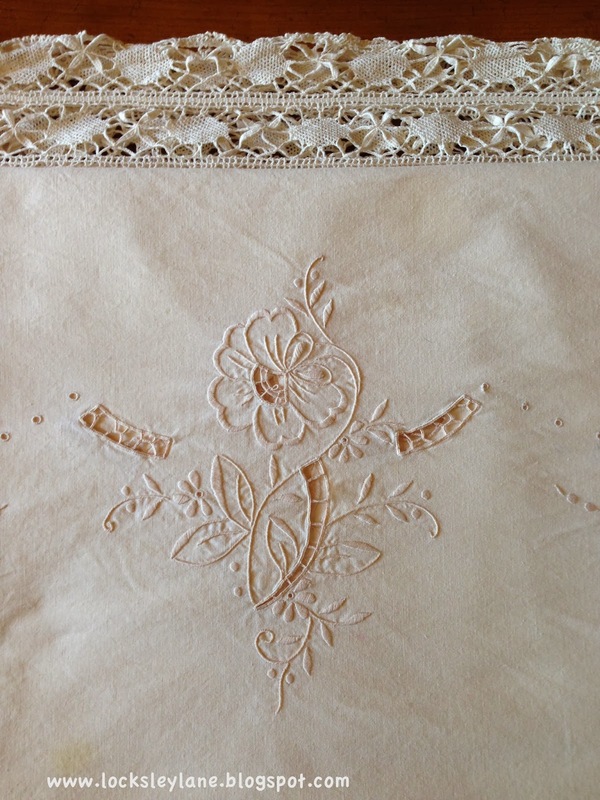 She hand stitched and embroidered beautiful monograms and letters on all kinds of linens. I remember as a little girl, seeing these huge monograms and crocheted edges on pillows that sat on their beds and remember how gorgeous they were. I didn't understand what I was looking at back then. You can see the intricate details and pulled spaces on the flowers below. Look at all of the crocheted edges..... this was also done by hand. Can you imagine? This beautiful white piece is from my mom's mom - the Irish grandmother. I think it is Irish lace, which would make sense coming from my mom's side of the family. 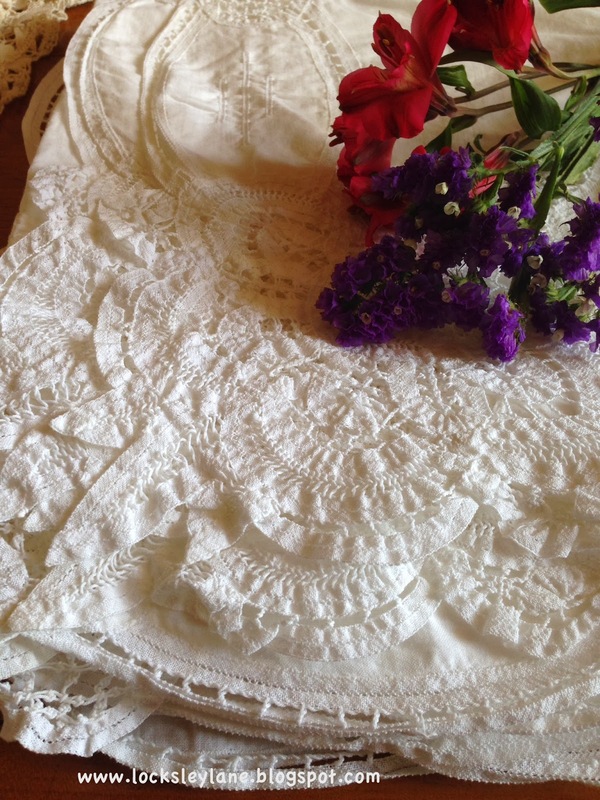 It too is a beautiful heirloom with intricate patterns and details. I'm not sure where it originated from but I love it just the same. In our rush to always buy new and trendy, we sometimes forget about the treasured old pieces that are handed down and tucked away somewhere. They are truly gifts not to be forgotten. 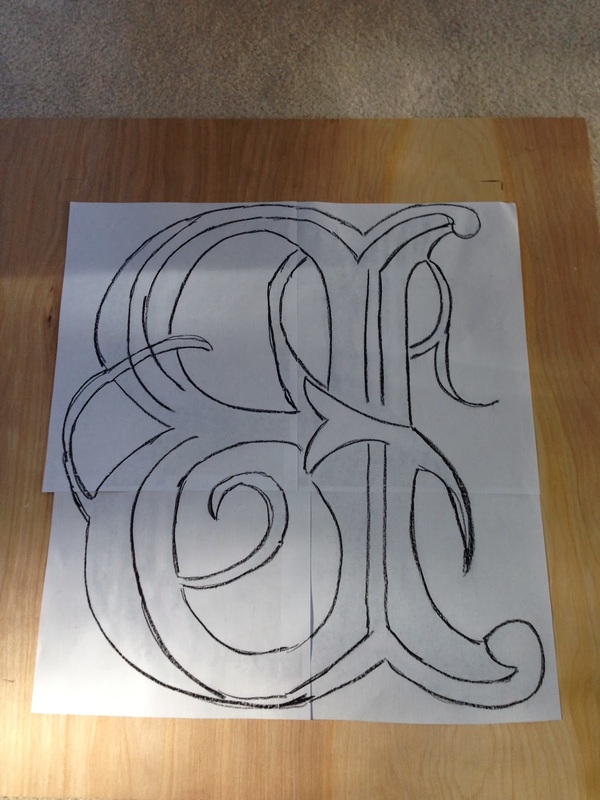 Monograms never really go out do they? Maybe for a little while we are less aware of them but when they come back, they always come back bigger than before. Lately, we see hats, scarves, phone cases, bags, coolers, sunglasses, boots, sweatshirts.... all with monograms on them. I have always loved monograms and initials in one form or another. I also have teenage girls and they just can't seem to get enough of them. My middle daughter has been wanting to fix her room up for awhile. I know poor... middle child. I was a middle child too and for some reason, we seem to get overlooked. I should know better. But fixing her room up didn't seem that important to her and now it is. Anyway, I decided to make her a sign to go over her bed with her initial on it. She was a bit skeptical at first and watched as I began this simple creation. 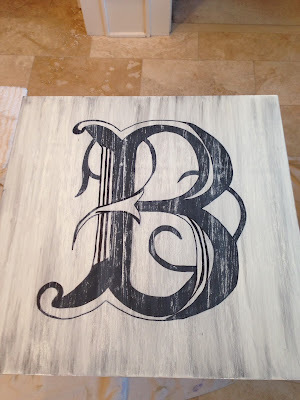 I've had some wood for awhile and got a bit of inspiration from my new blog friend Debbie at Tweak & Style Blog as she talked about signs last week. So you know, I am not a creative painter. 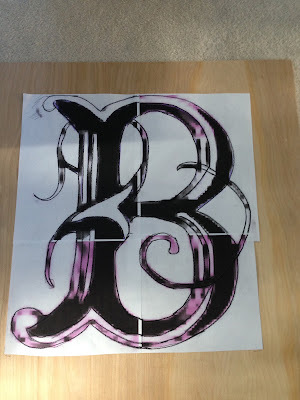 My mom is a wonderful water color artist where technique, flow and patience is a necessity. I like dressers, sanders, drills, wood putty...get the image with my creativity here? 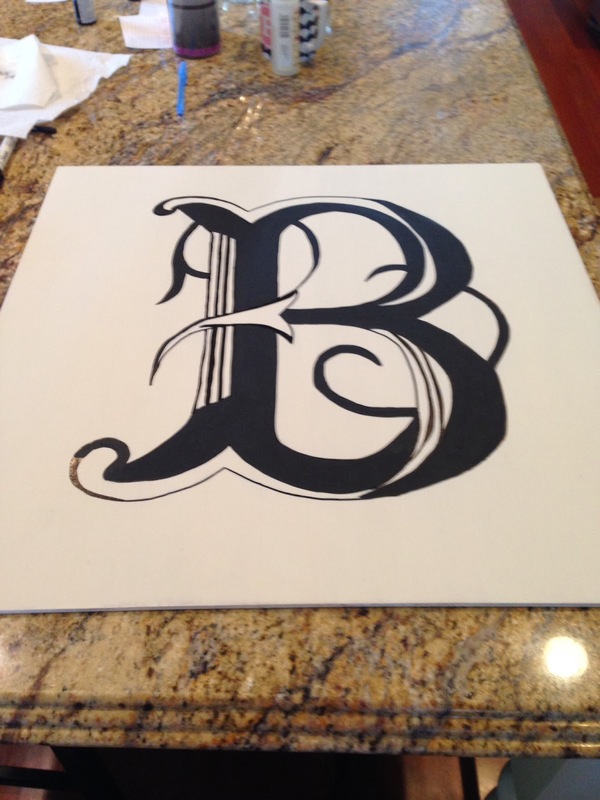 Painting a sign is actually very simple to do or I would not be posting about it. I did not use a projector nor was I able to download fonts to take to Office Depot - which you can do and they will blow up a graphic to any size if you need them to. The Graphics Fairy has great tutorials for Transferring graphics to furniture. I read over these great tips, and used some of this information and some of my own. I get frustrated when I don't have what I need, so I improvise - a lot. I found a font that I liked on dafont.com. This one is called extra ornamental. I was unable to download any new fonts to my computer for some reason, but I was able to print off a small picture as a jpeg. Once I had my.jpeg I followed the tutorial from the graphics fairy and used blockposters.com to get an image that I printed onto four 8"1/2 x 11" sheets of paper. The purple you see is due to my graphic used and my printer. If you have a bigger graphic, your printed piece won't look like this. My image was very small. 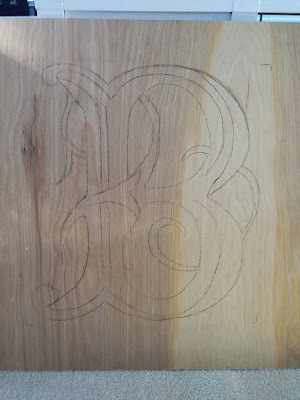 I taped my pieces together and then marked off the four corners on the wood, so I knew where to place this once my tracing was done. 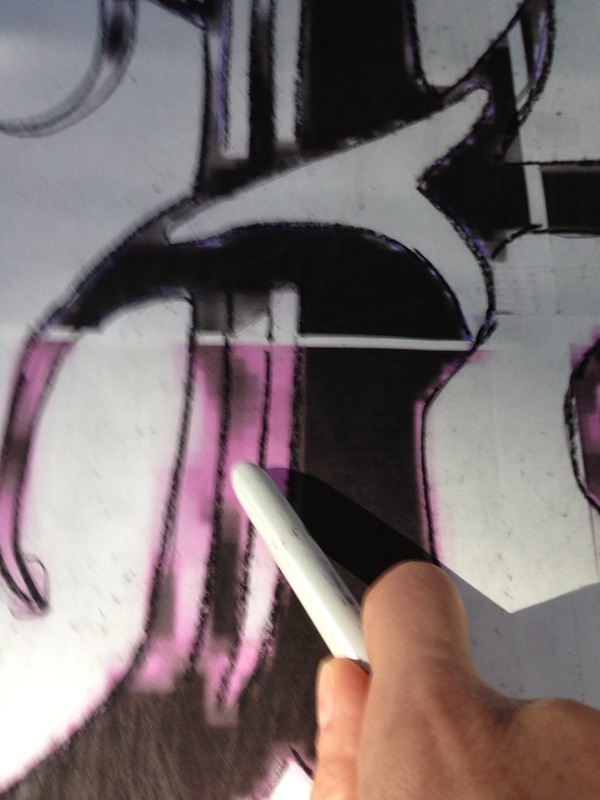 First, take a dark marker and trace your original image. 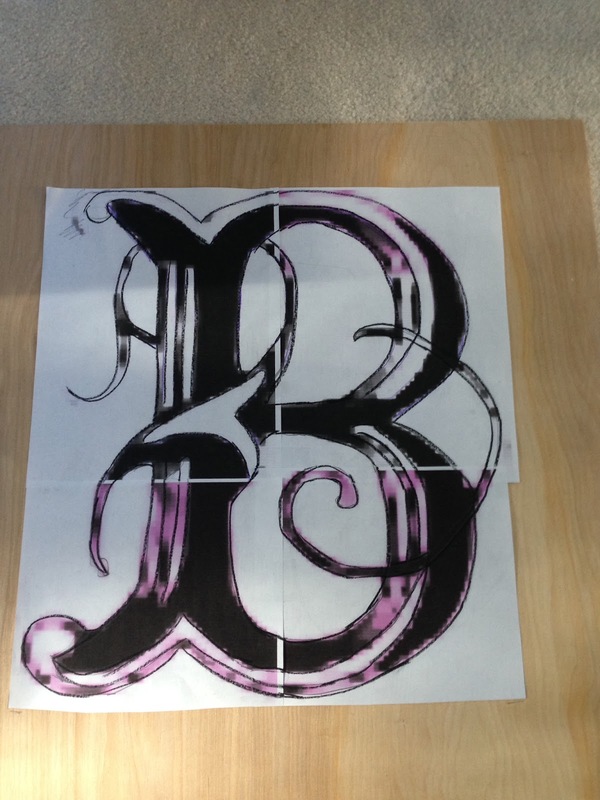 Make sure you fill in all of the edges so you will be able to see them when you turn your graphic over to trace on the wrong side. Then turn the paper over so your good image is on the bottom. Take your grease marker and trace your image on the reverse side. 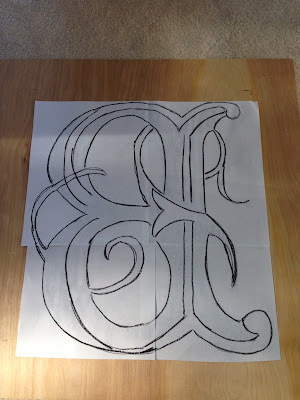 Your grease marker needs to be dark and heavy as you trace this on the reverse side. 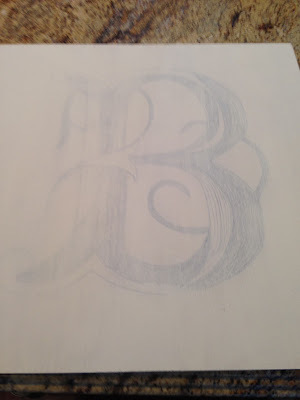 If you used a black marker on the original side, with good lighting, you should be able to trace this when it is turned over. Once you have used your grease marker to trace the reverse image, turn this over so the grease image is face to face with the wood. Line up your edges where you marked the original image to go. 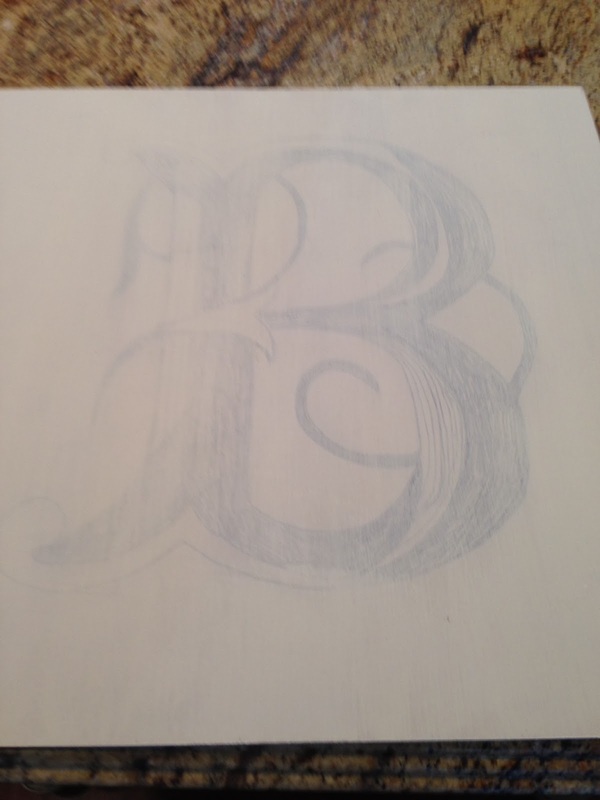 With the back end of a marker, or the bottom of a round utensil end, press and re-trace your image, so the grease marker on the back transfers to your wood. Now you have your image transferred. I know some of you might be thinking....she forgot to paint her board first. Technically, if you are good at transfers, you should paint your first coat and background color first. But, I didn't know if the transfer method would work, and I wanted to make sure my drawing (and erasing) didn't show up on my good paint. 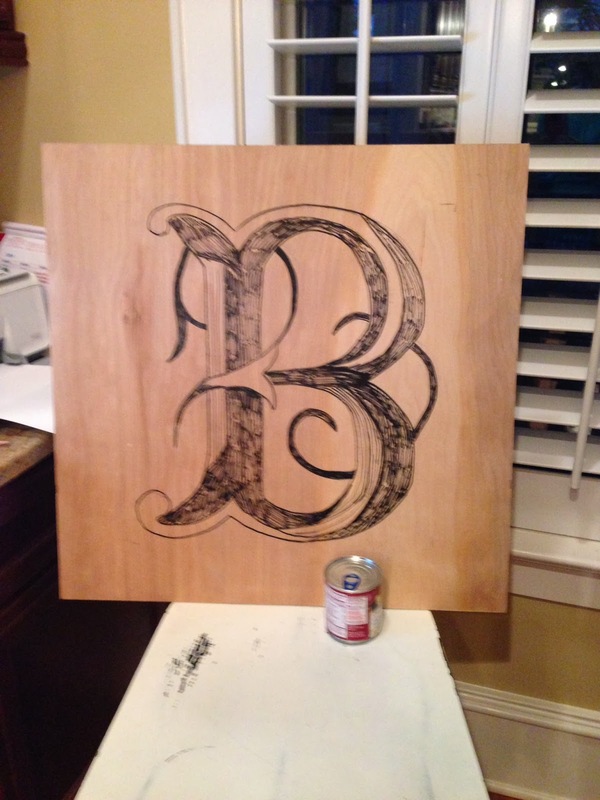 So I used a black acrylic sharpie marker to draw my stencil on my unpainted wood. Then I painted my board the color I wanted it to be. I knew from experience that using chalk paint with a little bit of water, would allow my image to bleed through. And it did! Now I have my background in Old White and needed to paint and fill in my stencil. I first used my acrylic sharpie to get the edges of my stencil drawn, then I used regular old black acrylic paint from Hobby Lobby to fill in the rest. Now comes the fun part! I wanted to paint the sign and make it look old. I took clear glaze, about 2 tsp and 2 tsp of black acrylic paint and mixed them together. Using a wet rag, I dipped it into the black glaze and wiped the glaze down in straight motions. 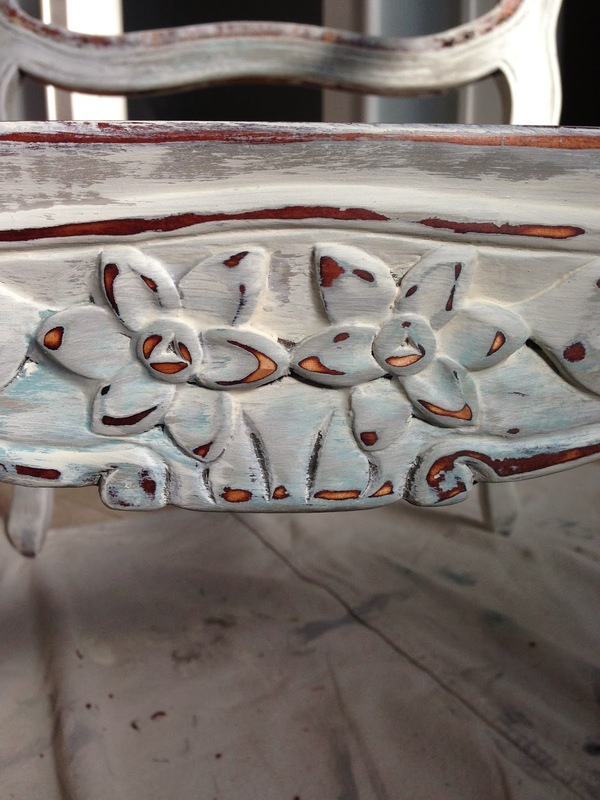 When this dried, I did the same combination of glaze and Annie Sloan Old White, and pulled this down as well. I needed the Old White paint to bring age to the black paint on the initial and on the board. When this dried, I took 220 grit sandpaper and a sanding block and distressed the board in up and down motions. This makes the paint look worn. I drilled two holes in the top and tied it with ribbon. I still need to wax and seal this but wanted you to see how it looked. My oldest daughter saw this and now she wants one for her room. This picture makes it look a bit pink, but it's the light of the room. Although I miss my furniture. I'm waiting for the weather to cooperate a bit more here in Charleston. It has been rainy and humid. Not the best for refinishing furniture in the garage. You don't need all the fancy projectors and things to get an image on the board. Just a little ingenuity. 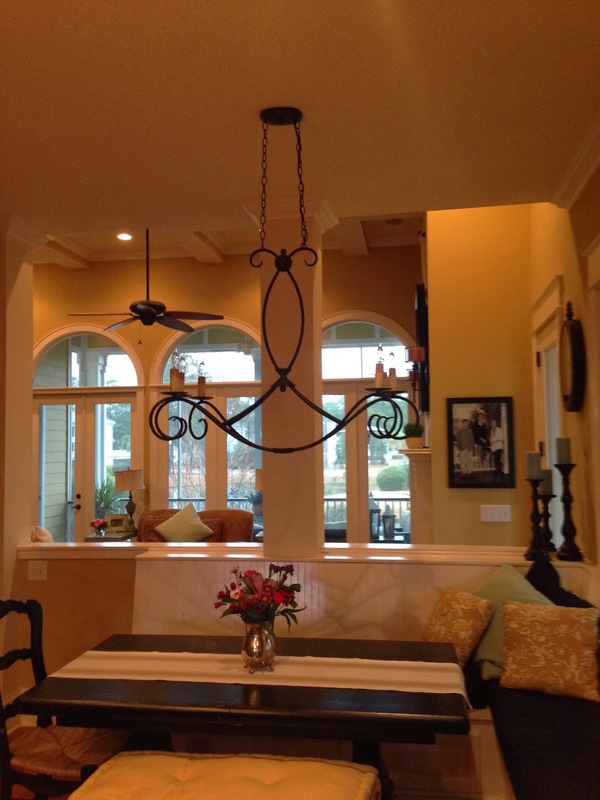 Light fixtures make a huge difference in a home. When we first moved into our new home I thought it was perfect just as it was and that I didn't need to change any of the light fixtures.....except one. We have a nook in our kitchen which prevents us from having a traditional table and chairs to work around. 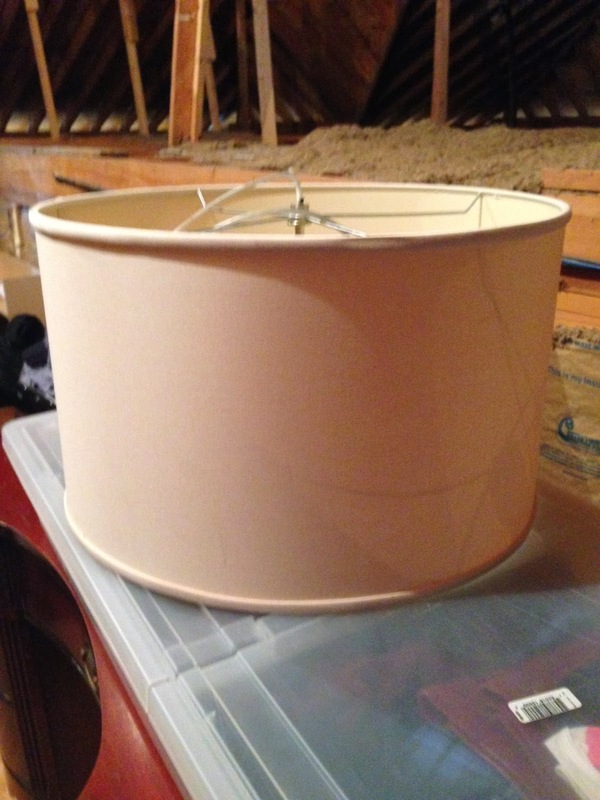 In the center of the nook, hung this large drum lamp. It didn't belong in the kitchen and you could see it from almost every room downstairs. It was out of place, blocked views and was unattractive. Let's just call a spade a spade. Here she sits in the attic, where she will most likely stay. My husband thought it looked great. Ha! It needed to go. 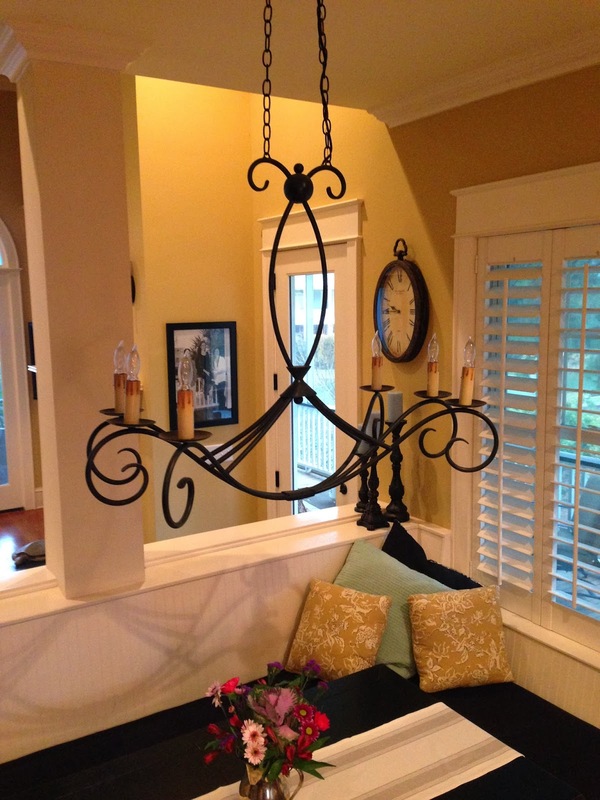 Finding or replacing chandeliers and lamps that work in your spaces is not an easy task. It took me several trips to different lighting stores and several wrong choices to find the right one. 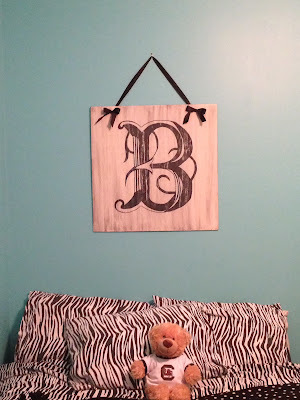 I knew as soon as I saw this, that it would be perfect for my little nook. 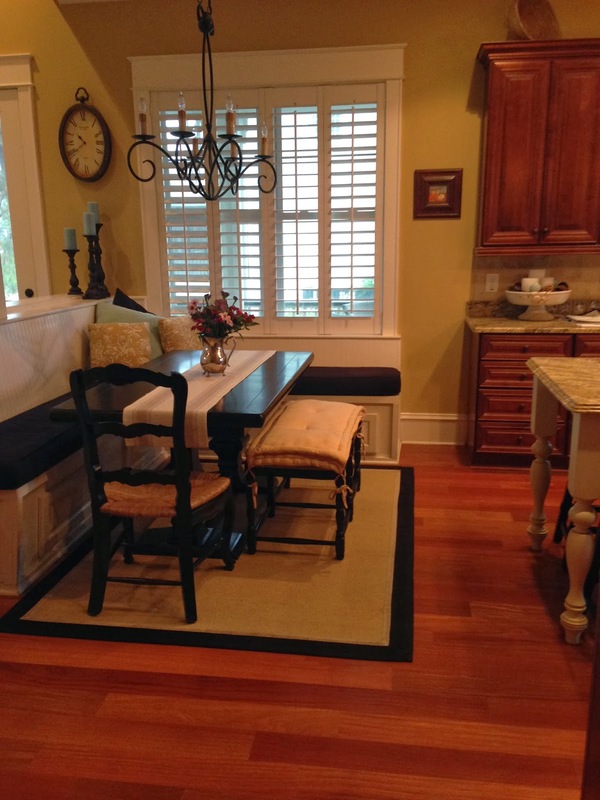 It is light, airy, whimsical and fits the openness of our floor plan. I love everything about it. It makes me happy just to look at it. When we first moved in, the nook was my least favorite place in the house. It was tricky to decorate. I had to find a pedestal table that would fit in the space allotted. The table couldn't have legs because you need to slide in and out of the built in side benches. It also couldn't be too wide, because I was limited on space. You can see the island that starts to the right. Once I found the table I opted for a small covered bench instead of additional chairs on the opposite side to keep the room open. 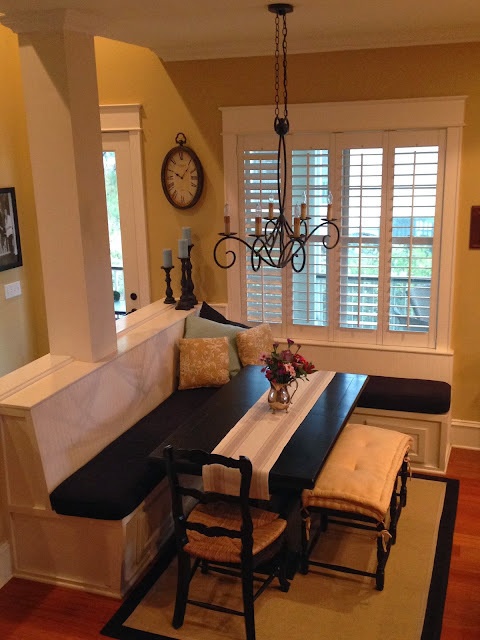 I recovered the seat cushions in black and put in plantation shutters. Lamps are easy to change and can make a complete difference in a room. If you don't like your lighting, change it. Take a picture of your space and bring it with you when you go shopping. Most lighting stores have people that can recommend what size and shapes will work best for your space. It really helps with all of the options available today. Monday, Monday....da da, can't trust that day - The Mama's and The Papa's. Rainy days and Mondays...always get me down - The Carpenters. We have way too many Mondays in our lives to let them be depressing. I get TGIF because it signals the end of the work week or the end of the routine. But, are we really "working for the weekend"? Mentally, that sets us up for a depressing Monday. New beginnings should be exciting. We get excited for New Year's Eve and make resolutions that will hopefully last an entire year. We celebrate and count down the clock for the new year. Why can't we celebrate the start of the new week in the same manor? Get fired up on Sunday! We get to create the week to look and feel however we want it to. I am going to try and love Mondays going forward. I'm going to see it as a fresh new start and a new beginning to whatever may come this week! This was an old tea table that had seen better days. 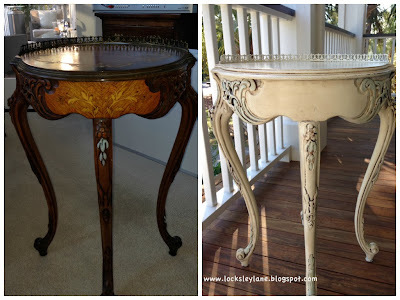 The top needed refinishing and quite frankly, I wanted to lighten it up! 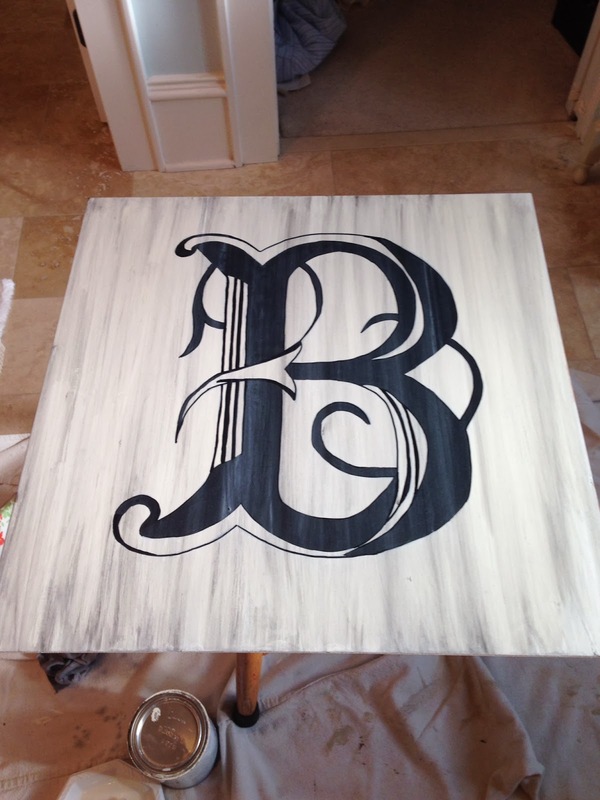 I wanted it to look old, so I used Old White with a dark wax. Then I added touches of Duck Egg. 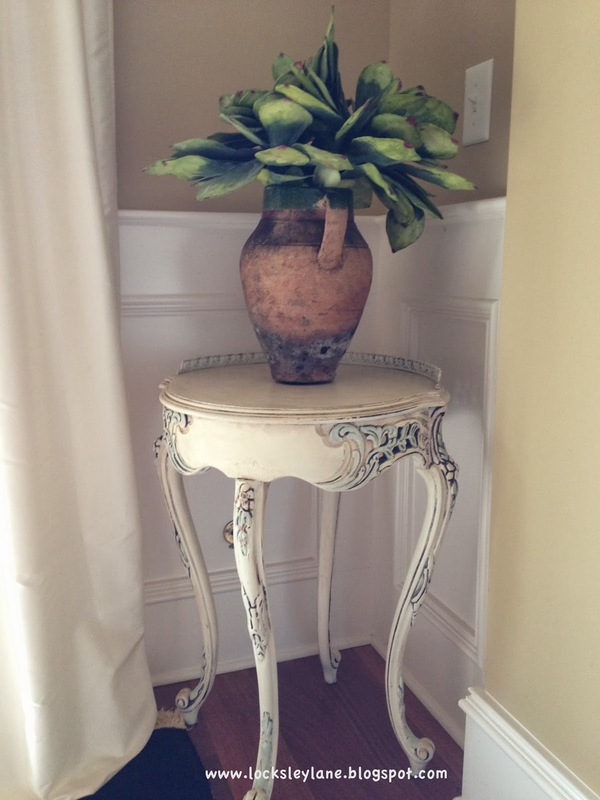 It sits in the corner of the dining room with an old olive jar. Monday, Monday. So glad you are here! I mean....I love birds. I am actually having a small obsession with them right now. It's funny how things come around in life. My mom use to have bird decorations in our house on Locksley Lane; quails, owl bookends, plates.....we even had a parakeet named Sparky that sat in the kitchen for awhile. Although we found him in the yard and adopted him, he wasn't really a chosen decoration. My Italian Grandma also loved birds and had a large marble owl that sat on this huge marble stand in her formal dining room. It kind of spooked me a bit back then, but now I can see the beauty of it. I never really gave bird decor much thought until recently. Now, I love them as accessories and decorations. They make the house feel warm and inviting. It also adds a bit of sophistication to your spaces. 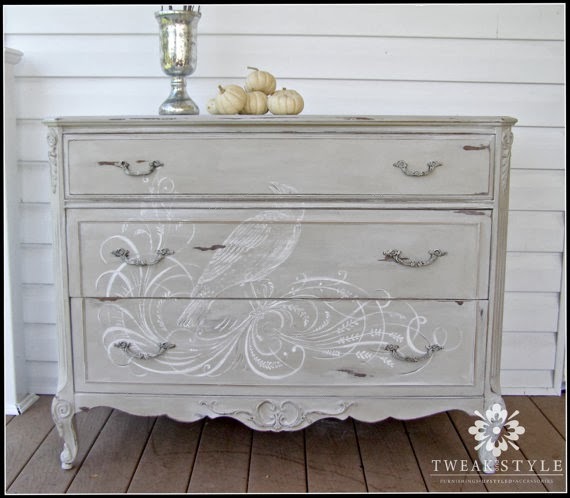 Look at this beautiful dresser from Tweak and Style. Follow this link and Debbie will walk you through how she did this step by step. She is a talented artist! She also has great ideas on her blog and will certainly inspire you so check out the rest of her blog too. These adorable bird accents above can be found at Joss and Main. 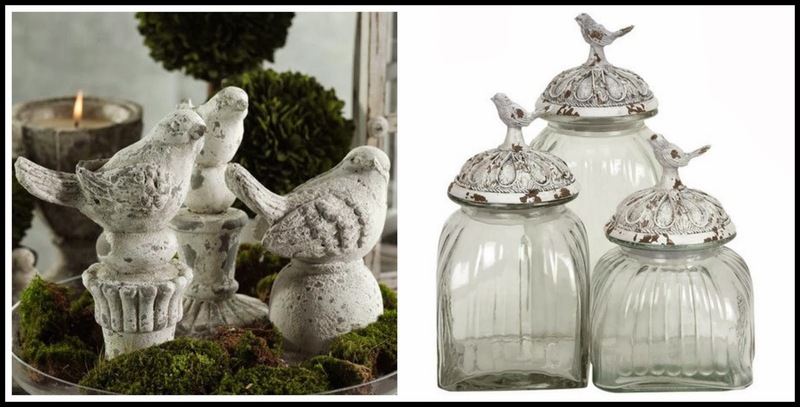 I love the bird jar tops. 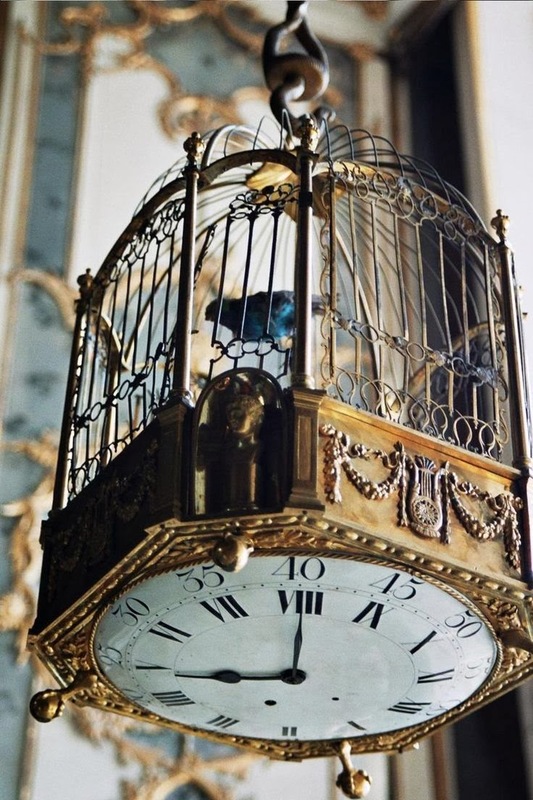 Look at the fabulous bird cage and clock above. I do not know where this originated from but think it is just beautiful. These are random bird pictures from Pinterest that I put together because of my new obsession. I'm slowly starting to make some new bird purchases. I will keep you posted. 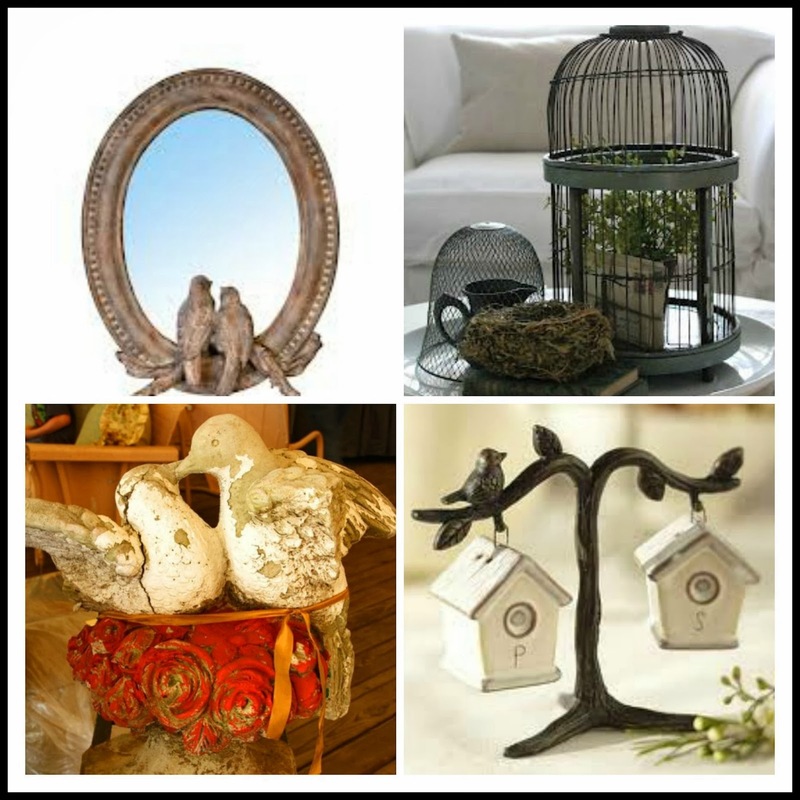 Do you have bird decor in your house? Send me a picture. I'd love to see!